Delaware Tech student James Elliott was elected 2019-2020 international president of the Phi Theta Kappa (PTK) Honor Society on April 6, 2019. Elliott is the first international president from Delaware Tech. He is a member of PTK's Alpha Zeta Kappa Chapter at the Wilmington Campus. 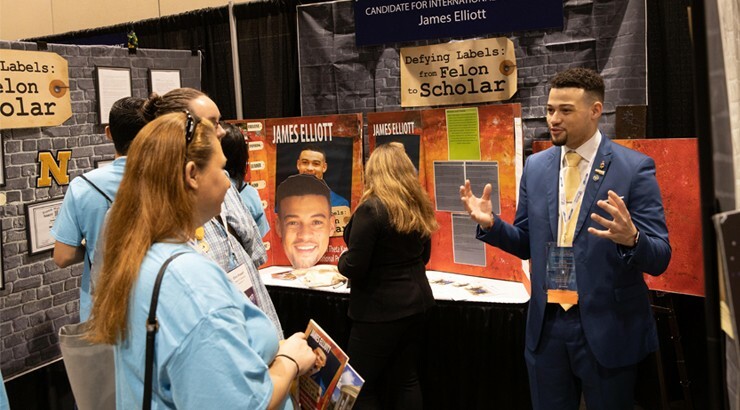 Elliott campaigned for the role over the past several months, culminating in an election in Orlando, Florida at PTK Catalyst, a conference that brings together PTK students and advisors from around the world. Nearly 4,000 people were in attendance, representing about 600 chapters. There were 13 candidates for international president. They hosted booths, made videos and campaigned on social media. A primary poll narrowed the pool to two candidates. The final two candidates delivered a two-minute speech about "Transformations: Acknowledging, Assessing, and Achieving Change." This was followed by a rally where students could speak with their candidates, followed by a live caucus with PTK President and Chief Executive Officer Dr. Lynn Tincer-Ladner. "It was an incredible weekend that could have never happened without the support of my Delaware Technical Community College and Phi Theta Kappa family," said Elliott. "I would like to take the time to thank all who supported me from Dr. Brainard and the Delaware Tech administration, marketing team, my chapter's (Alpha Zeta Kappa) advisors and fellow members, along with the Human Services and Drug and Alcohol department. I am forever grateful for this life-changing experience that will be a launching pad for my bright future." Elliott is studying human services and drug and alcohol counseling. He will pursue a criminal justice degree while he fulfills his term as international president. In the future, Elliott hopes to become a lawyer and advocate for prison reform and higher education in prison. "We could not be more proud of James, whose hard work, determination and commitment are nothing short of inspirational," Delaware Tech President Mark T. Brainard said. "His willingness to share his personal story to help others is just one example of his leadership, and that, combined with his focus and drive, will serve him well as international president of PTK." Elliott has a unique story and has overcome many odds on his path to success. At the age of 19, while a student at Delaware Tech, he was convicted of a felony and sentenced to prison. During his incarceration, Elliott realized the importance of education and completed a correspondence course. After his release, he returned to Delaware Tech. Elliott enjoys sharing his story with others in hopes of empowering them to defy their own labels. He based his campaign for international president around the theme "Defying Labels." During his term as president, Elliott will preside at PTK's annual convention and Honors Institute, as well as representing PTK at regional meetings and educational conferences. Elliott also was chosen as the keynote speaker at the American Association of Community Colleges Convention later in April. "I don't have the words that adequately express the pride I have in James," said Pattie Van Atter, Delaware Tech Phi Theta Kappa Advisor & Regional Coordinator. "I am proud that he's a scholar, and that he is the international president of Phi Theta Kappa Honor Society, and I am very proud to have had a small part in his transformation at Delaware Tech. What I am most proud of, though, is what James has taught me and so many others expressed so fittingly by Gandhi: 'The best way to find yourself is to lose yourself in the service of others.' What a gift James has given us." Phi Theta Kappa is the premier honor society recognizing the academic achievement of students at associate degree-granting colleges and helping them to grow as scholars and leaders. It is made up of more than 3.5 million members and nearly 1,300 chapters in 10 nations. Learn more at ptk.org. Top: James Elliott is announced as International President at PTK Catalyst. He is pictured here with the outgoing International President Elda Pere from Bergen Community College, also from the Middle States Region. Bottom: Elliott chats with fellow students at his campaign booth at PTK Catalyst.